Bruce Blucher's name won't be known to many but to my mind he's a key New Zealand musician, having been in some of the best Dunedin bands of the 80s and 90s. Recently I took a look at Flying Nun releases I would like to see re-released now the label is back under the control of Roger Shepherd. 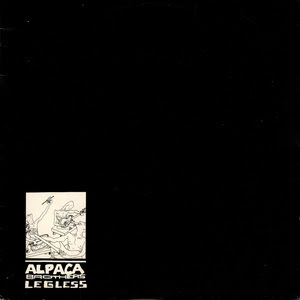 One of those was an EP that features Bruce Blucher - the Alpaca Brothers Legless EP. The Alpaca brothers also included future Snapper and former Clean member Peter Gutteridge and former Look Blue Go Purple member Norma O'Malley. The song 'Hey man' from that EP made it onto the Flying Nun boxset, but the whole EP deserves re-release. Blucher has played both guitar and drums for any number of other Dunedin and New Zealand acts such as This Kind of Punishment and Sandra Bell but it's for a couple of his own bands that I best remember him. One is Cyclops a Dunedin super band including Blucher, former another Look Blue Go Purple member Kathy Bull and Peter Jefferies. They were active in the very late eighties and early nineties and released some great singles, mainly on obscure American labels. Cyclops recorded material was collected together on the Goat Volume CD in 1999, sadly it too is now very hard to find. Following on from Cyclops Blucher formed Trash - a band with a darker heavier sound who released 3 albums Grit and Butts, Not Gate and Mihiwaka. Trash split in the mid 90s - I was there to witness it as they literally disbanded one night on stage at the Empire Tavern with Blucher throwing down his guitar and about to storm off, until drummer Robbie Yates told him to pick the f***king thing up, plug it in and play. In 1994 Blucher recorded with Viv Crowe as Brown Velvet Couch on a single called Once in a Very Blue Moon. The single shows the influence of The Renderers also active in Dunedin at the time. I'm not sure but I think Viv may have been the publican at the Empire Tavern. Later in the 1990s Blucher performed as Pointy Little Stick - unfortunately only a couple of tracks remain on long out of print Arc Records compilations - 'The Walk' appeared on Arc Records comp Flying Way Too High and 'Aha' was on the 1999 Arclife comp. I'm not sure if Bruce Blucher still makes music - around the turn of the century he took up a career as a stonemason - but I'm a big fan and I hope he's still churning out those dirty chords. And - there's one particular Blucher project I haven't been able to track down that I'd dearly love to hear. It was a band called Pink Plastic Gods, they released an album called In The lap of the Gods in the 90s. If you can help me out please email or leave a comment. yes was fortunate to play on that Ep, with Bruce and Nick Wilkinson. A fantastic experience making it with Terry Moore, recording in Bruce´s house, will never forget it.